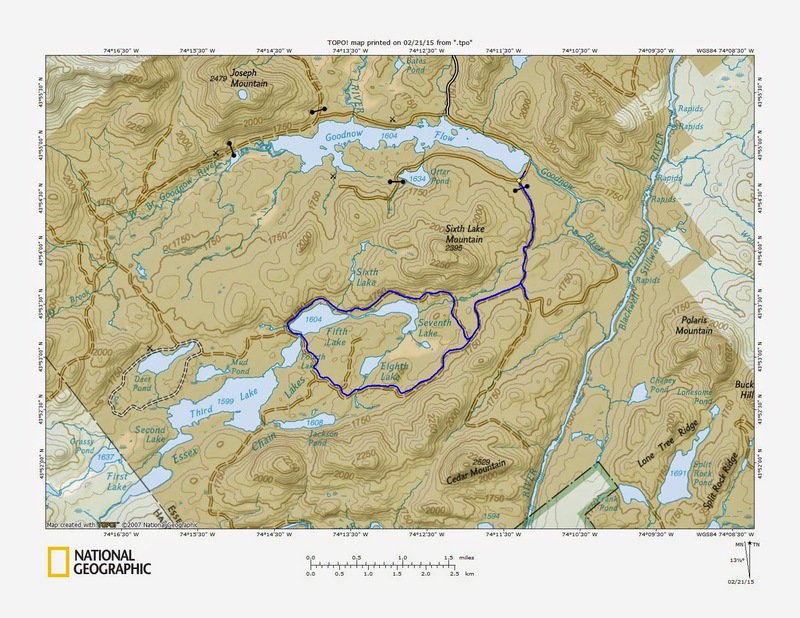 The Essex Chain Lakes Primitive Area is the latest addition to the State Forest Preserve and has been a welcome addition to the Adirondack Park, especially for paddlers. The series of lakes have easy access with short carries between them. 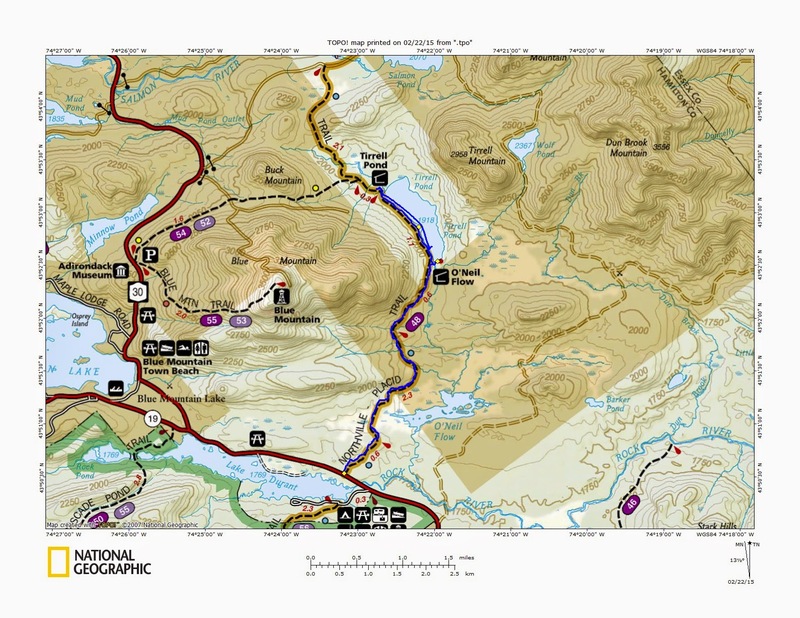 Designated campsites have been established and an interim use plan has been established until the Unit Management Plan is drafted and adopted. 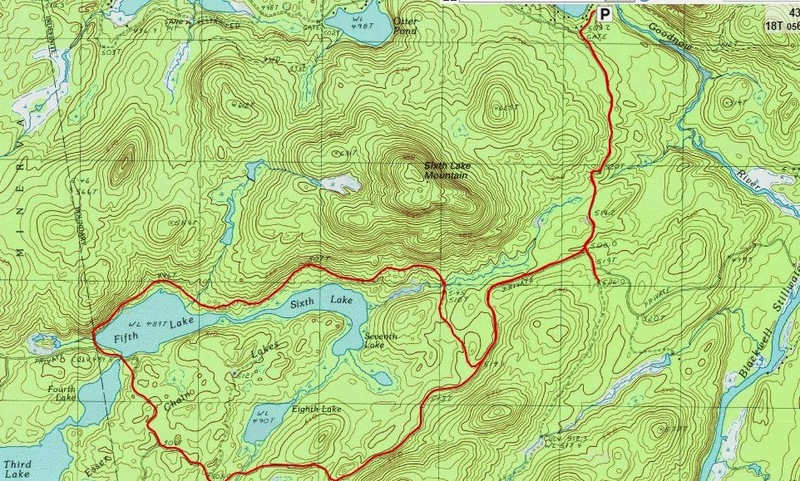 Snowmobilers, skiers and hikers also have options for various loops around the lakes. 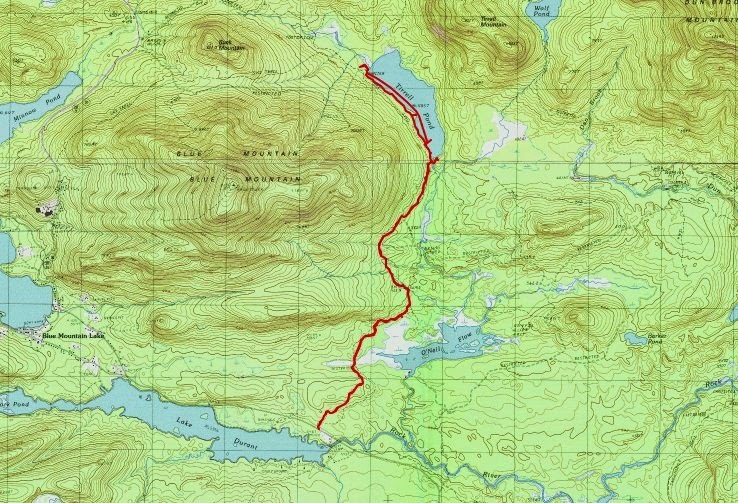 Today we took the opportunity to go to the east end of the Goodnow Road and XC ski the Chain Lakes Road to an old logging road and we looped around Fifth Lake through Eighth Lake (see map below). Snowmobiles had been on the Chain Lakes Road, but at 1.25 miles when we turned right on a logging road, the snowmobile tracks were covered in 4-6 inches of snow. At 2.6 miles we turned right again on another logging road to go around the north side of Sixth Lake and Fifth Lake en route to a counter clockwise loop around the lakes. 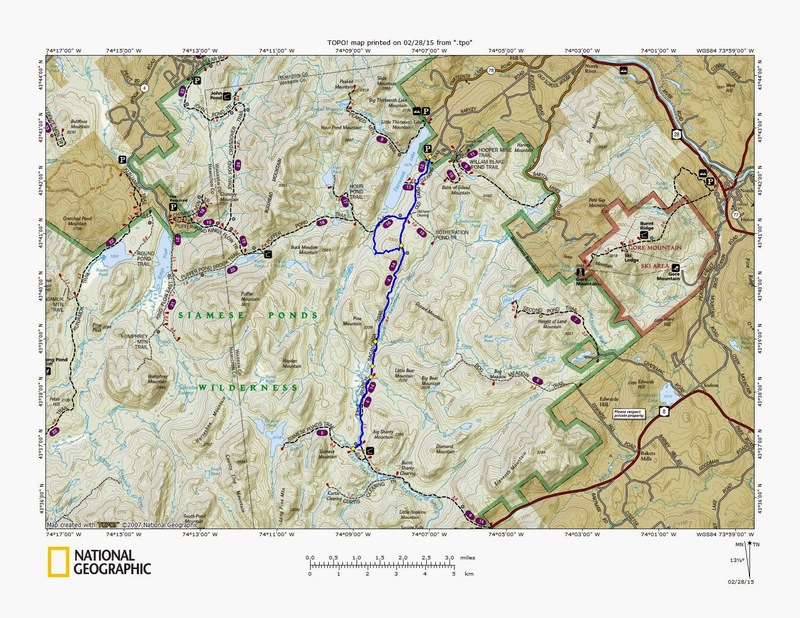 These logging roads are not marked, so if you choose to explore this area, make sure you bring a good map perhaps a GPS unit. The sky was overcast, and we were skiing in advance of an afternoon snow storm that was predicted by mid-afternoon. After an hour and a half and 3.7 miles, we reached Sixth Lake. The logging road does not go the the waters edge, but you can easily make your way a couple hundred yards to the water. At 4.6 miles, we could see the larger Fifth Lake. We chose not to ski across the frozen lakes but rather stay on the logging roads. At the west end of Fifth Lake we turned south to start our loop, rather than continue west towards Third Lake. Soon we came to a small culvert that connects Fifth Lake to Fourth Lake. After crossing the culvert we continued to break the old snowmobile trail on the logging road which was now heading in a SE direction. At our next junction we were reunited with a fresh snowmobile track. We never did see any snowmobiles during the day, but it was nice to ski on a fresh track. Now that we were on a fresh track, we made good time closing the loop and getting back to the Chain Lakes Road. Snow flakes were just beginning to fly. We had good timing finishing our ski and getting back home before the roads got bad. 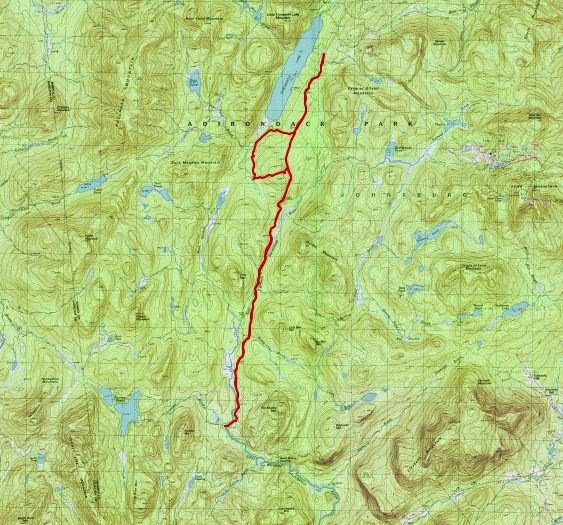 I didn't realize it until we got home and I looked at the DEC website, but there is a 4.2 mile Upper Hudson ski trail (lolipop route) that starts right near where we parked. Next time we are in the area, we'll stop in to check it out. The Hoffman Notch transverse seems to intrigue many people. Everyone says to me "I've always wanted to do that trail". 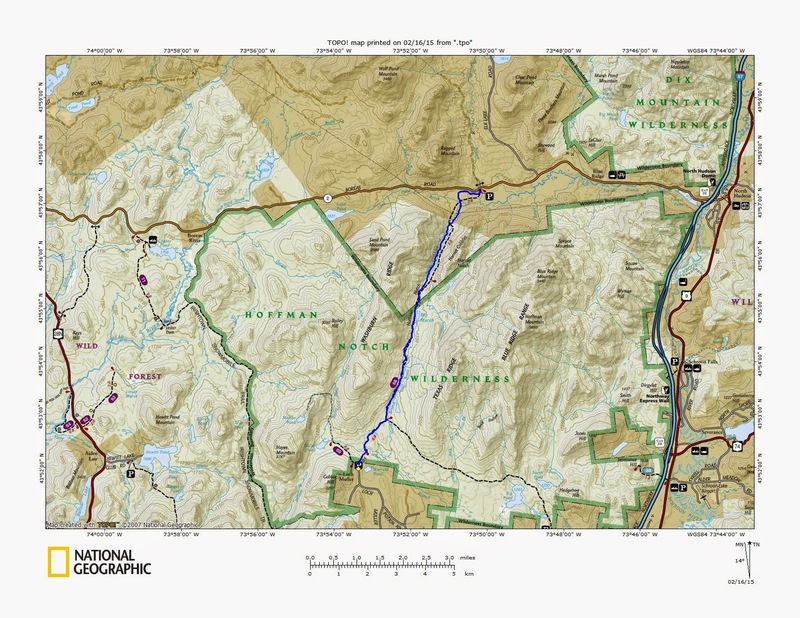 If you look at a trail map, it sticks out like a sore thumb; a long straight line traversing the whole Hoffman Notch Wilderness from north to south. 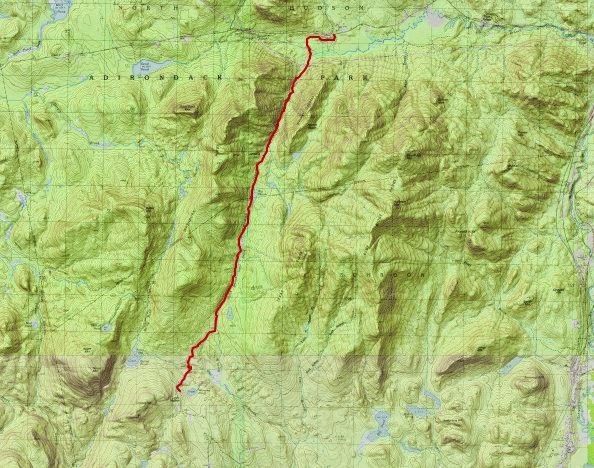 There are not many other trails in the area, so it stands out even more on the map. Then people look at the logistics. The trail is 7.4 miles long so a coordinated car spot is needed, unless you do a key swap or a down and back hike. Then there are the amenities on the trail... Big Marsh; that's it. No lean-to, no fancy lake, no fantastic summit view, just a marsh and a notch. But maybe there is something there. Solitude perhaps. Yes, most definitely. 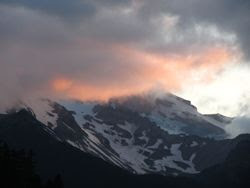 Even in summer, there is a good chance you will not see another hiker. In winter, the odds grow greater. So...our little group of 4 (Bill, Justin, Leesa and I) plus dog Rev set out in approximately -20 wind chill to do this traverse in winter. We met at the former Frontier Town at 10:30 (hoping for a little added warmth to the day). After dropping 2 days at the northern end of the trail on Blue Ridge Road, we got ourselves and the other 2 cars down to Loch Muller and the southern terminus of the trail. After quickly organizing ourselves, we hit the trail and got into the woods and out of the wind. Rev took her accustomed position in the lead and we were off. Under 4-6" of snow was an old snowshoe track (probably mine from several weeks prior). The going was easy and we swung into a rhythm. At 1.2 miles we came to the junction with the Big Pond trail. This is where my old tracks turned off. Still, there was another set of old tracks we followed north towards Big Marsh and Hoffman Notch. I was hopeful (but doubtful) that the old tracks would continue all the way through the notch. My doubts were soon realized when suddenly we were walking in 2 feet of unconsolidated snow. The base formed by those old snow covered tracks had vanished. No problem, we had 3 guys willing to take turns breaking trail. The snow while deep, was fluffy and not heavy; that simplified our work. We stopped at Big Marsh and all pulled out our cameras and took the same pictures, but we all quickly put our cameras away. The wind was now hitting us from across the marsh. We had to resume our movement to stay warm. Progress slowed as we broke trail in the deeper snow. We were moving a little over a mile an hour. It didn't really matter, we would still be out by dark unless something went wrong. We also had plenty of headlamps and winter gear in our packs. At 4.6 miles we reached the southern (high) end of the notch and began our descent into the notch. Shortly after we entered the notch we were once again greeted with snowshoes tracks underfoot; we no longer had to break trail! Needless to say, our speed picked up on the packed trail that was headed downhill. This looked like a hot tub! It probably wouldn't have felt that way though. Down in the notch, the sun was no longer able to shine on us and it felt a little colder. We kept moving, crossing several nice foot bridges that have been constructed in recent years. Near the end of the hike we caught up with a couple who had created the packed snowshoe track for us. I thanked them as we passed. I had expected this hike to take us about 4 hours. It ended up being 45 minutes longer than that, mostly due to the trail breaking we had to do in the mid-section of the hike. Reunited with 2 of our cars, we drove back around to the south to pick up the other two, then we stopped at our camp for some hot chocolate before Bill and Justin had to hit the road for the drive home. Thanks guys for the nice hike today. It was the first time I had done this traverse in winter.